Photovoltaics systems are quite different from traditional methods of generating electricity. Their power production is directly affected by the weather and the time of day – I. e. they can’t produce electricity without sunshine. Ironically, photovoltaic cells are also affected by the sun’s heat becoming less efficient at high temperatures. One important quality of photovoltaics is their flexibility. Unlike nuclear plants, for example, PV systems can be made small enough to power a hand-held calculator, or large enough to power an entire community. When the demand for electricity increases, a PV system can simply be enlarged, provided the owner can afford it. Photovoltaic is a young technology and important questions remain as to how it should best be used. Among these questions are: What kind of backup should be provided for nighttime or cloudy days? should solar systems be installed at homes or at special generating stations? and should utilities or individuals own and operate solar electric systems? Despite these questions, photovoltaics are already used in hundreds of different ways. Those applications fall into four broad categories: stand-alone systems, grid-connected units, central utility stations, and consumer products. Each category is discussed below. As the name implies, stand-alone photovoltaic systems are virtually self-sufficient. They provide all the electricity for a particular application, operating without a utility-line backup. They are typically small systems, generating less than 10 kilowatts of electricity, but some are substantially larger. Stand-alone systems are most commonly found in areas far from power lines. Ranchers, for example, often install solar-powered water pumps to replenish livestock watering holes in distant grazing areas. These solar systems do not require constant refueling like diesel generators and often cost half as much as power line extensions. More than 1200 Arizona homes or cabins rely on stand-alone photovoltaics as their main source of electricity. In particular, PV powered homes are becoming a common sight on Arizona’s Native American reservations. More than 140 homes on the Navajo Reservation get their electricity from the sun, and the Hopis are working toward 350 such homes. The Hopis do not allow power lines to enter their villages and have relied for years on diesel generators or batteries, or have simply lived without electricity. “Four villages have (utility) power lines running 1/8 to 1/4 miles from the village”, said Doran Dalton, sales manager for the Hopi Solar Electric Enterprise. “We don’t hook up to the power lines because of our long-standing tradition of self-sufficiency. We don’t have an objection to electricity, we simply want to own the source by which we get it. Most Hopis live with very little electricity, and rely on small PV systems that power only a few lights and perhaps a television set. Families that consume more energy install larger PV systems that provide electricity for all the conveniences of a modern home – microwave ovens computers, stereo systems, washing machines, evaporative coolers and lights. Home PV systems can also power energy-consuming air conditioners and clothes dryers but these sizeable PV systems can cost more than $40,000. Despite their vast electricity resources, utility companies also use stand-alone photovoltaic systems instead of extending costly power lines. Many warning sirens at Palo Verde Nuclear Generating Station draw their power from solar panels. Photovoltaics also furnish electricity for mountaintop microwave repeater stations owned by Salt River Project. Stand-alone photovoltaics are used for numerous other applications in Arizona, including: nearly 100 monitoring stations owned by the U.S. Geological Survey, some fire watch towers, a commercial radio station transmitter near Prescott, numerous emergency roadside telephones, billboards, and many irrigation or watering system controls. At a recreation area near Roosevelt Lake, photovoltaics furnish all the electricity for indoor and outdoor lights and toilet fans. Homes or devices connected to photovoltaic systems as well as utility power lines are called “grid-connected systems.” The utility can supply power at night, when electricity is cheapest, or simply serve as a backup. Federal law mandates that utility companies must purchase any excess power produced by the PV system, although at a reduced rate. Homes or devices that employ both types of power are not common in Arizona, and the biggest reason is probably money. Photovoltaics can be extremely cost-effective when compared to the price of extending power lines. However, for individuals who live in cities or already have grid electricity, the choice to install PV is more difficult. Homeowners must weigh the cost of utility bills – a few hundred dollars a month at the most – against the price of a photovoltaic system that can cost thousands of dollars for a typical house and a typical energy lifestyle. As the price of PV decreases, and the cost of utility power increases, PV systems will compare more favorably for grid-connected applications. In fact, utility companies like Salt River Project are already preparing for that possibility. Individuals who are not connected to the utility grid sometimes install utility lines to power only one or two home items. One Scottsdale couple lived without utility power for seven years, relying entirely on a PV system and propane generator backup. This off-grid system was sufficient to power an evaporative cooler and the other electrical devices in their home. When in 1990, temperatures reached 122 degrees Fahrenheit, they decided to install an air conditioner. To meet the unit’s electrical demand, the couple had to choose between doubling the size of the solar system (another $17,000), or paying for a power line at less than $8,000. The rest, as they say, is history. The same couple discovered an interesting problem that sometimes occurs with photovoltaic systems. Electricity provided by their PV system did not follow perfect sine-wave form, as does utility power. That change in the quality of electricity ruined their computer printer two times before the couple discovered the reason—a faulty inverter. Low cost, high quality inverters are now available that avoid this problem. There are now some enormous fields of photovoltaic arrays among the Saguaro and Ocotillo of Arizona’s deserts. Connected to the utility grid, their combined power may equal production at large coal plants such as the Navajo Generating Station near Page. Today, however, the world’s largest central photovoltaic power plant generates a maximum of only six megawatts of electricity – 125 times less than each of three units at the Navajo station. This plant, called the Carrisa Plant project, was built in 1984 by ARCO Solar Corporation (now called “Siemens Solar”) and is connected to the grid owned by Pacific Gas & Electric Company. The Carissa Plain plant covers dozens of acres of land with photovoltaic arrays mounted on two-axis trackers. Mirrors, placed next to the arrays, help reflect light to increase the potential power output. Unfortunately, the intense reflected light has partially destroyed the protective module coatings and has actually decreased production of electricity. Further development of better coatings should solve this problem. For those reasons, the Carissa Plain plant is slated to be dismantled. Since, 1984, its only revenue has come from electricity sales to Pacific Gas and Electric Company. The electricity is purchased at PG&E’s “avoided cost” of producing electricity – a price even lower than wholesale. In the meantime, worldwide demand for photovoltaic panels has dramatically increased and their value has risen. Consequently, it is more economical for the owners of Carissa Plain to sell the individual modules than to sell the electricity they produce. Near Sacramento, California is another photovoltaic central power plant that has operated since 1984. The plant was built in two stages, called SMUDPV-1 and SMUD PV-2 and together they generate up to two megawatts of electricity at maximum production – enough to power 400 to 500 homes. The total plant employs more than 58,000 photovoltaic modules and occupies more than 20 acres of land. So far, three photovoltaic central power plants have been built in Arizona. One completed in 1982 at Phoenix’s Sky Harbor Airport, was once the world’s largest grid-connected photovoltaic power plant. It was designed to produce 225 kilowatts of power using concentrator solar modules. The plant was dismantled in 1987, when the lease was not renewed. APS has donated many of the panels from the plant to Arizona high schools and others are still being researched at the Solar Test and Research Center (STAR Center) in Tempe. The Solar Test and Research Center was established in 1998 to test the effectiveness of different photovoltaic equipment in the Arizona climate. It features five photovoltaic arrays, each producing 2 kilowatts of power used in the APS grid. 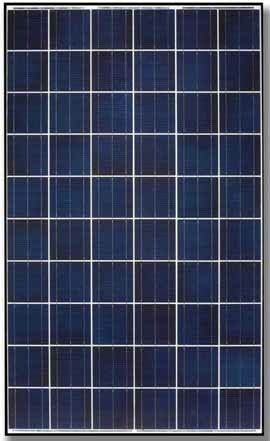 Many different types of photovoltaic cells are represented in the arrays. Data obtained from the STAR Center provides valuable information about photovoltaic systems and how they operate. For example APS has found that single-axis sun tracking systems improve electrical output by about 20 percent and double-axis trackers improve output another 20 percent. They have also found that output decreases about 10 percent in midsummer, when the weather is hottest. Arizona’s other photovoltaic central power plant is not utility-operated. It belongs to a 24-home subdivision in Glendale, Arizona called “Solar One.” The first-of-its-kind subdivision was constructed by John F Long Homes, with a photovoltaic field along its south side. The 2600-panel system provides 192 kilowatts of electricity at peak output and provides much of the electricity used by homeowners during daylight hours. The utility company provides nighttime power and purchases any excess produced by the PV system. Until rates changed in 1991, some Solar One homeowners actually received refund checks from the utility company. Photovoltaic central power plants have also received attention abroad. They have been constructed in Denmark, Greece, Spain, Germany, Saudi Arabia and Japan. From toys to security systems, ever-growing arrays of consumer products operate on electricity supplied by photovoltaic cells. These products are available through catalogs, at many Arizona photovoltaic companies, and even in some department stores. An estimated 200 million people already own PV-powered calculators and wristwatches. Other solar-powered devices include: portable camping lights, Frisbee-sized pool cleaners, small fans that roll up in car windows, and hats with tiny fans for extra cooling. Car manufacturers such as Mazda and Audi now offer a “solar sunroof” option in some new car models. These sunroofs, incorporating see-through photovoltaic cells, power ventilation systems that help cool a parked car as much as 20 degrees. PV cells have also been used to power entire electric cars. Landscape lights and security systems are practical, photovoltaic-powered products that are growing in popularity. Depending upon the size and complexity of these systems, owners can avoid hundreds of dollars in expenses for digging power line trenches or hooking-up to a power line.